Last night we worked out this diagram of the waste and vent system to help ourselves figure out how many fittings of which type we need. 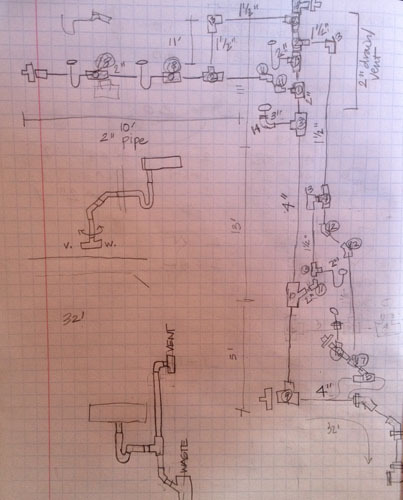 I used similar sketchy diagrams to do the irrigation plumbing, and I find them kind of useful to work out how I'm going to solve a problem, and also to generate a parts list. As always, it's really just a start, and we will need to buy more fittings to get it all finished, but this is pretty close. 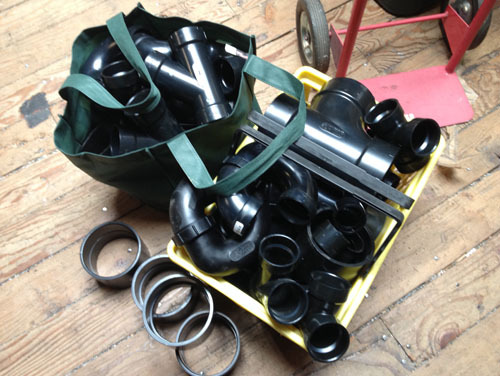 Today we went over to the Neumanskys' house to talk PEX design (I'm going to start generating a parts list for the supply lines as well), then on the way home we went to Pagano's and purchased a pile of ABS pipe fittings and some pipe (not all we need, but a good start). 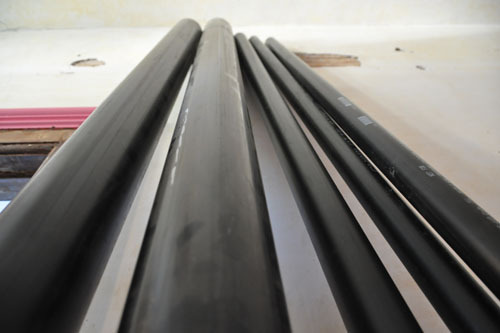 ABS is generally used for drains in single-family residential work in this area, because it is cheap and easy to work with. Commercial and multi-family will often use cast iron, but between carrying and cutting that can be a real pain. We will switch to cast iron where the drain goes through the roof, for durability, but everything else is plastic. It wasn't so bad driving home four blocks with the tailgate open and six 10-foot ABS pipes sticking out the back. We didn't buy everything we need, but enough to make a decent start on the waste lines. 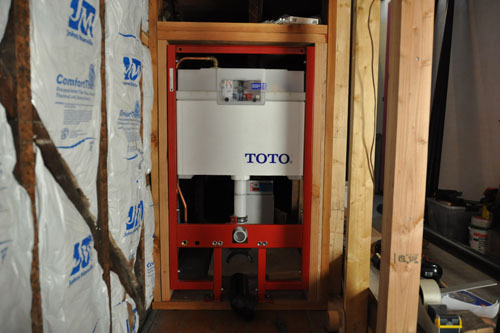 The first, critical part of the system is the waste line under the downstairs toilet. That will set the height for the rest of the system. 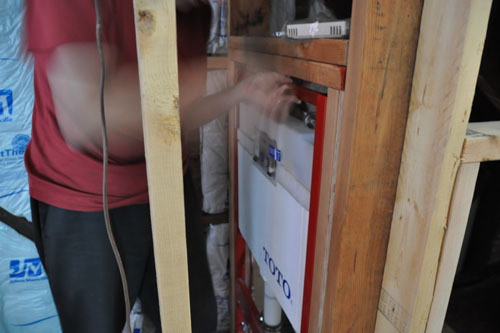 So before we got started, Noel raised the tank so the toilet isn't dragging on the floor (a good thing, I think). You probably can't tell the difference, but it's about 1 1/4" higher than it was yesterday. That gives us more room to fit the drain in there, too. We bought a new 4-inch hole saw at Pagano's, and Noel widened the drain hole so we can get the connectors in there. What we did not buy were the flexible connectors we need to connect the toilet tank to the waste system, so I'll have to stop by tomorrow on my way home from work or something, so we can get more done. In the meantime, I glued together the first chunk of the system, the waste and vent connection for the downstairs toilet. 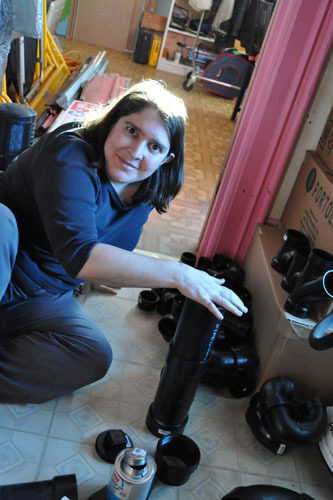 And we did a bunch of measuring under the house to be sure things would fit. Tonight I am reading up on water testing the DWV (drain-waste-vent) system. Woo-hoo.